Bud and Missy's mother, suggesting Norman to get out of the Mushroom World. 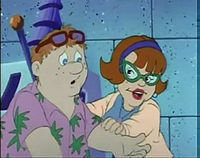 Bud and Missy's mother is a minor Wichitan character in The Adventures of Super Mario Bros. 3, appearing once in the episode "Mush-Rumors" alongside her husband Norman and their two children. She is the only member of Norman's family that does not have a given name. Bud and Missy's mother usually calms the children down in intense situations, such as when the children excitedly ask if they are at Wild Waldo's One-of-a-Kind Amusement Park and when Norman's family accidentally drives into a Warp Zone that leads them into the Mushroom Kingdom. As rumors about the family are spread among the Mushroomers, the Doom Ship soon attacks the "aliens" only to have Mario and Luigi save the family. The Doom Ship then brings the station wagon to Castle Koopa. Bud and Missy's mother gets frightened, but still believes they are in the real world and mistakes King Koopa for "Wild Waldo." Before the family can object, Kooky von Koopa takes the family to his lab to use his new Transmutational Brainwave Analyzer. After Kooky gets his results, Mario and Luigi break in and save the family from King Koopa's plan. Mario and Luigi then direct the family back into the car, which the mother thanks, and Norman drives the family back into the real world. In the Super Mario World episode "Rock TV," Koopa spies on a real world family in a flashback. Among them is a woman resembling Bud and Missy's mother. This page was last edited on January 22, 2019, at 18:01.